Plumas County is a county in the Sierra Nevada of California, United States. As of the 2010 census, the population was 20,007. The county seat is Quincy, and the only incorporated city is Portola. The largest community in the county is East Quincy. The county was named for the Spanish Río de las Plumas (the Feather River), which flows through the county. 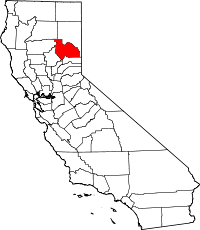 Prior to the California Gold Rush of 1849, the indigenous Mountain Maidu were the primary inhabitants of the area now known as Plumas County. The Maidu lived in small settlements along the edges of valleys, subsisting on roots, acorns, grasses, seeds, and occasionally fish and big game. They were decentralized and had no tribal leadership; most bands lived along waterways in and around their own valleys. Areas with high snowfall, including the Mohawk and Sierra valleys, were hunting grounds for game in the warmer months. In 1848, European Americans discovered gold in the Sierra foothills. Miners were attracted to Plumas County in particular, largely due to the tales of Thomas Stoddard, who claimed to have discovered a lake lined with gold nuggets while lost in the wilderness. Gold-hungry prospectors flooded into the area. Though hopeful miners scoured the glacial lakes (now designated as the Lakes Basin Recreation Area) for months, they did not find the purported lake of gold. But some had success panning for gold in the rivers and creeks in the area, and created squatters' villages, the first non-Native American settlements. Rough shanty towns quickly sprang up around successful mining areas, including Rich Bar, Indian Bar, and Rabbit Creek (now La Porte). Many were developed adjacent to the Feather River, named by Spanish explorer Captain Luis Arguello as Río de las Plumas in 1820. In 1850 notable African-American frontiersman James Beckwourth discovered the lowest pass through the Sierras, which became known as Beckwourth Pass. Using the pass, he blazed a trail that began in Western Nevada and went through much of Plumas County, eventually terminating in the Sacramento Valley. This trail was followed by many erstwhile miners into Plumas County. Beckwourth also set up a trading post in the western Sierra Valley that still stands today. Though the Beckwourth Trail was longer than the original emigrant trail that ran south of Plumas County, its lower elevations extended its seasonal use when the higher trail was snowbound and impassable. The Beckwourth Trail had heavy use until about 1865, after construction of the transcontinental railroad, when railroads became the favored transportation method for westward-bound travelers. Plumas County was formed in 1854 during a meeting of three commissioners held at the American Ranch in Quincy. It was carved from the eastern portion of Butte County. Quincy, originally a mining town, was chosen as the county seat after an early settler donated a plot of land there to establish the seat. Once it became the seat, nearby Elizabethtown faded and ultimately became defunct. In 1864, the state legislature took a large portion of Plumas County to organize Lassen County because of increasing population. Shortly afterward Plumas County annexed part of Sierra County, including the prosperous mining town of La Porte. Over the next decades, different industries drove the growth of the various settlements that sprung up around the county. Greenville began as a mining and farming community in Indian Valley in the late 1850s. Chester was formed near the area that is now Lake Almanor, as a result of cattle ranching and the timber industry. When the Western Pacific Railroad was constructed in 1910, Portola developed as an important railroad stop. Thanks to the railroad, Plumas County could export its lumber beyond the local area, and the timber industry became dominant in the county’s economy for decades. As the railroad route extended up the Feather River Canyon, it was also used by the area’s first tourists and sightseers. When the Feather River Highway was completed in 1937, through federal investment in infrastructure by President Franklin D. Roosevelt during the Great Depression, Plumas County became linked to the Sacramento Valley year-round thanks to the route’s low elevation. According to the U.S. Census Bureau, the county has a total area of 2,613 square miles (6,770 km2), of which 2,553 square miles (6,610 km2) is land and 60 square miles (160 km2) (2.3%) is water. Plumas County is located in the far northern end of the Sierra Nevada range. The area's rugged terrain marks the transition point between the northern Sierra Nevadas and the southern end of the Cascade Range. Lassen Peak, which is the southernmost volcanic peak in the Cascade Range, is found just north of Plumas County's border, and part of Lassen Volcanic National Park extends into the northwest corner of the county. Plumas National Forest's 1,200,000 acres (4,900 km2) offer a wide variety of outdoor recreation opportunities, including hiking, camping, kayaking, swimming, mountain biking, hunting and fishing. The area features more than 100 natural and artificial lakes. Many of the natural lakes are glacial in origin and can be found in and around Lakes Basin Recreation Area. The artificial lakes include Lake Almanor, Lake Davis, Frenchman Lake, Little Grass Valley Reservoir, Antelope Lake, and Buck's Lake. Plumas County also features more than 1,000 miles of rivers and streams. All three forks of the Feather River run through the area. The 2010 United States Census reported that Plumas County had a population of 20,007. The racial makeup of Plumas County was 17,797 (89.0%) White, 192 (1.0%) African American, 539 (2.7%) Native American, 134 (0.7%) Asian, 18 (0.1%) Pacific Islander, 603 (3.0%) from other races, and 724 (3.6%) from two or more races. Hispanic or Latino of any race were 1,605 persons (8.0%). As of the census of 2000, there were 20,824 people, 9,000 households, and 6,047 families residing in the county. The population density was 8 people per square mile (3/km²). There were 13,386 housing units at an average density of 5 per square mile (2/km²). The racial makeup of the county was 91.8% White, 0.6% Black or African American, 2.6% Native American, 0.5% Asian, 0.1% Pacific Islander, 1.8% from other races, and 2.6% from two or more races. 5.7% of the population were Hispanic or Latino of any race. 16.1% were of German, 15.0% English, 10.1% Irish and 8.0% American ancestry according to Census 2000. 95.4% spoke English and 3.6% Spanish as their first language. There were 9,000 households out of which 26.4% had children under the age of 18 living with them, 55.4% were married couples living together, 8.0% had a female householder with no husband present, and 32.8% were non-families. 27.5% of all households were made up of individuals and 10.1% had someone living alone who was 65 years of age or older. The average household size was 2.29 and the average family size was 2.77. In the county, the population was spread out with 22.7% under the age of 18, 6.0% from 18 to 24, 22.6% from 25 to 44, 30.8% from 45 to 64, and 17.9% who were 65 years of age or older. The median age was 44 years. For every 100 females there were 99.8 males. For every 100 females age 18 and over, there were 97.9 males. The median income for a household in the county was $36,351, and the median income for a family was $46,119. Males had a median income of $38,742 versus $25,734 for females. The per capita income for the county was $19,391. About 9.0% of families and 13.1% of the population were below the poverty line, including 16.7% of those under age 18 and 6.4% of those age 65 or over. Plumas County has five elected Supervisors, each elected within their own district. The Board of Supervisors oversees the management of county government and members serve four-year terms. The Clerk of the Board of Supervisors provides support to the Board of Supervisors and information to the public. The purpose of the County Administrative Office is to facilitate the delivery of cost-effective county services in accordance with the vision and policies outlined by the Board of Supervisors. The responsibilities of the County Administrative Office include monitoring legislative affairs, preparing the county's annual budget, and undertaking studies and investigations for the Board of Supervisors. The Sheriff is the chief law enforcement officer of the county. The jurisdiction of the Sheriff extends throughout the county, including federal and state lands. The County Sheriff is elected to the non-partisan office for a four-year term and is charged with preserving the peace, enforcing criminal statutes, and investigating known or suspected criminal activity. More than three-quarters of Plumas County's 2,618 square miles (6,780 km2) is National Forest Service land. The management of Plumas National Forest is overseen by three districts: Beckwourth Ranger District, Mt. Hough Ranger District, and Feather River Ranger District. In its early history Plumas was a reliable Republican county, voting for that party in every election from 1864 to 1908. Plumas then became one of the most reliably Democratic counties in California, voting for the Democratic candidate for President in thirteen straight elections from 1928 to 1976. The county has voted Republican in every presidential election since 1980, except for 1992 when Bill Clinton won a small plurality. Plumas County is in California's 1st congressional district, represented by Republican Doug LaMalfa. At the state level, Plumas is in the 1st Senate District, represented by Republican Ted Gaines, and the 1st Assembly District, represented by Republican Brian Dahle. The town of Portola is home to the Western Pacific Railroad Museum, one of the largest railroad museums in North America. The WPRM is one of the major tourist draws in the county. The town of Chester is home to the Collins Pine Museum, a museum completed in 2007 and dedicated to educating the public about the history of the Collins Pine Company's (a division of The Collins Companies) logging operations in the Chester region. The Plumas County Museum located in Quincy, CA is notable for exhibits on the Maidu people, the California Gold Rush, logging, and the Variel House. The museum also hosts contemporary art exhibits. The primary local news source since 1866 is Feather Publishing Co., Inc. at plumasnews.com. Four Plumas County newspapers are published every Wednesday, except for certain holidays. Plumas County is in the Sacramento television market. KXTV, News10, Sacramento and KCRA-3, Sacramento regularly cover major news events in Plumas County. The Feather River National Scenic Byway follows the Middle and North Forks of the Feather River, traversing steep canyon walls and high mountain valleys. The route features grasslands, oak woodlands, mixed conifer, and high desert chaparral. It begins in the Sacramento Valley, following the Feather River Canyon and entering Plumas County just west of Storrie. As it gains elevation, it climbs over the crest of the Sierra and passes through Quincy and Portola, eventually finding its way to the Middle Fork of the Feather River and following it to its headwaters in Sierra Valley. After going through Beckwourth Pass, the route terminates at Hallelujah Junction on Highway 395. The southernmost point of the Volcanic Legacy Scenic Byway, Lake Almanor, is located in Plumas County. The route spans 500 miles between California and Oregon and has views of dramatic volcanic landscapes, including nearby Lassen Peak. The Scenic Byway Link refers to the section of Highway 89 that connects the Volcanic Legacy and Feather River Scenic Byways. Featuring the alpine meadows of Indian Valley, the rushing waters of Indian Creek, and the stunning views of Mt. Hough and the surrounding mountains, the route is about 18 miles long. Plumas Transit Systems, operated by the county, provides local service in Quincy and routes to Chester and Portola. Gansner Field is a general aviation airport located near Quincy. Rogers Field is located near Chester; in addition to its civil-aviation role it also serves as the Chester Air Attack Base, a logistical & coordination facility for the California Department of Forestry's aerial firefighting (both fixed-wing and helicopter). Resources include fueling, retardant loading, communications, and some quartering for aircrew and ground fire-fighting teams. Nervino Airport is in Beckwourth, east of Portola. The population ranking of the following table is based on the 2010 census of Plumas County. ^ "Official visitor information for Plumas County, Northern California". Plumascounty.org. Retrieved 7 November 2017. ^ "Plumas County, CA - Official Website - Northern Maidu". Countyofplumas.com. Retrieved 7 November 2017. ^ Young, Jim (7 November 2017). "Plumas County: History of the Feather River Region". Arcadia. Retrieved 7 November 2017 – via Google Books. ^ a b "PCMA". Plumasmuseum.org. Retrieved 7 November 2017. ^ "The Jim Beckwourth Trail". Beckwourth.org. Retrieved 7 November 2017. ^ "2010 Census Gazetteer Files". United States Census Bureau. August 22, 2012. Retrieved October 3, 2015. ^ "Plumas National Forest - Recreation". Fs.usda.gov. Retrieved 7 November 2017. ^ "Lakes Basin Recreation Area Community". Plumascounty.org. Retrieved 7 November 2017. ^ "Plumas County, CA - Official Website - About Plumas County". Countyofplumas.com. Retrieved 7 November 2017. ^ "U.S. Decennial Census". United States Census Bureau. Retrieved October 3, 2015. ^ "Historical Census Browser". University of Virginia Library. Retrieved October 3, 2015. ^ Forstall, Richard L., ed. (March 27, 1995). "Population of Counties by Decennial Census: 1900 to 1990". United States Census Bureau. Retrieved October 3, 2015. ^ "Census 2000 PHC-T-4. Ranking Tables for Counties: 1990 and 2000" (PDF). United States Census Bureau. April 2, 2001. Retrieved October 3, 2015. ^ "Plumas County, CA - Official Website - Board of Supervisors". Countyofplumas.com. Retrieved 7 November 2017. ^ "County Administrative Office". Plumas County, California. Archived from the original on April 10, 2013. Retrieved November 13, 2013. ^ "Plumas County, CA - Official Website - Sheriff / Coroner". Countyofplumas.com. Retrieved 7 November 2017. ^ "Forests and Wilderness, Plumas County Northern California". Plumascounty.org. Retrieved 7 November 2017. ^ "Plumas National Forest - Beckwourth Ranger District". Fs.usda.gov. Retrieved 7 November 2017. ^ "Plumas National Forest - Mt. Hough Ranger District". Fs.usda.gov. Retrieved 7 November 2017. ^ "Plumas National Forest - Feather River Ranger District". Fs.usda.gov. Retrieved 7 November 2017. ^ "California's 1st Congressional District - Representatives & District Map". Civic Impulse, LLC. Retrieved March 1, 2013. ^ a b c d e f g h i j Office of the Attorney General, Department of Justice, State of California. Table 11: Crimes – 2009 Archived 2013-12-02 at the Wayback Machine. Retrieved 2013-11-14. ^ "America's Byways". Byways.org. Retrieved 7 November 2017. ^ "Scenic Byways in Plumas County Northern California". Plumascounty.org. Retrieved 7 November 2017. ^ "2010 Census Interactive Population Search : Greenville Rancheria (Maidu Indians)". Census.gov. Retrieved 7 November 2017. ^ "2010 Census Interactive Population Search : Almanor". Census.gov. Retrieved 7 November 2017. Wikimedia Commons has media related to Plumas County, California.